Ascocentrum christensoniamum is a relatively small orchid with an exuberant bloom. In nature the plant is found in Vietnam at an altitude between 100-700 meters, growing on the branches of deciduous trees. This orchid likes a hot to warm climate. When it blooms, it has a cluster of (usually) white-pink flowers (attached to a stalk of 10-15 cm). It grows well on a piece of bark or in a hanging pot. 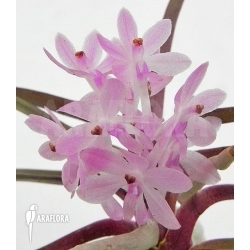 Ascocentrum is a small group in the family of orchids; they are closely related to Vanda orchids with which they are a good match for cross-breeding. Sorry, no written information on this Araflora Ascocentrum christensonianum. Additional information about this orchid will become available later. The symbols below will give you some indications for this Ascocentrum christensonianum. We are working hard on adding valuable information as soon as possible. No orchid care information of Araflora available. The plantcare symbols below will give you an indication about the Ascocentrum christensonianum. We hope to have text available soon.